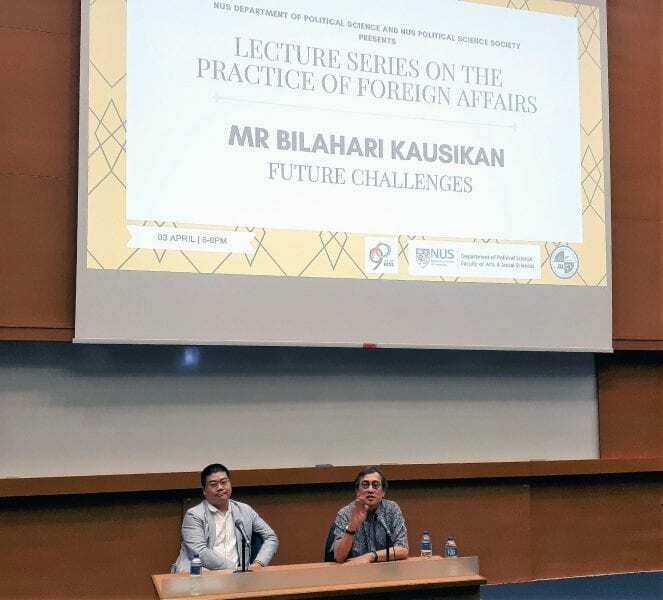 On 3 April 2019, Mr Bilahari Kausikan discussed Singapore’s future foreign policy challenges as well as the nation’s best path forward at his fifth and final FASS90 Political Science Lecture on the Practice of Foreign Affairs. Foreign affairs and diplomacy are inherently nuanced – subtle endeavours that do not always lend themselves easily to the masses. 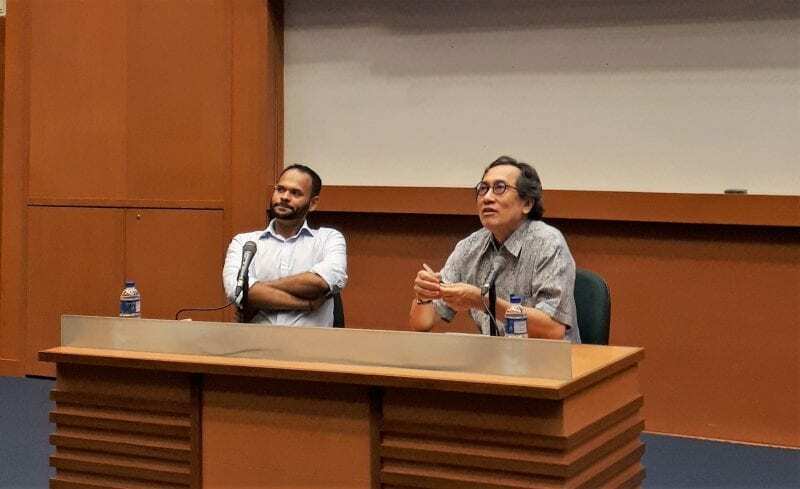 “Most people in every country take only a cursory interest in foreign affairs, and thus find superficial narratives possible,” said Mr Kausikan. Combined with the fact that the effects of foreign policy are less visible on the home front, the general population will either be completely unaware of Singapore’s diplomatic actions or worse, come away with an inaccurate and superficial understanding. 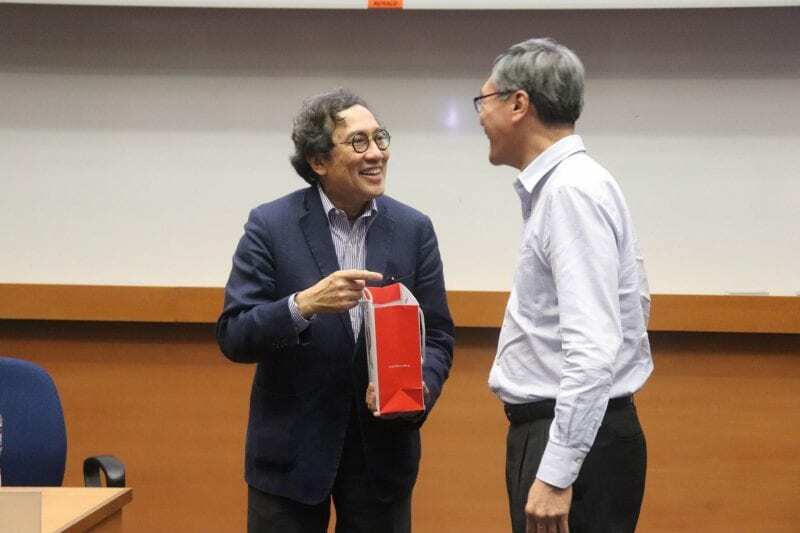 Quoting the late Dr Goh Keng Swee, he cited the mistaken belief that statecraft can be performed in the same way as business negotiations. Both Dr Goh and Mr Kausikan emphasized a healthy relationship between two countries involves treating each other as fellow sovereign states first and foremost, regardless of any disparity in size, population or economy. Mr. Kausikan responding to questions with Deputy Head of Department of Political Science Assoc Prof Ian Chong. While undeniably succinct and memorable, Mr Kausikan would probably agree that a more complete statement would be that small states cannot behave in a manner proportionate to their size, especially when dealing with larger states. Singapore may be dwarfed by global superpowers like the United States and China, but it must not succumb to staying out of the way and “surrendering ourselves to our fates” especially when national interests are at stake. 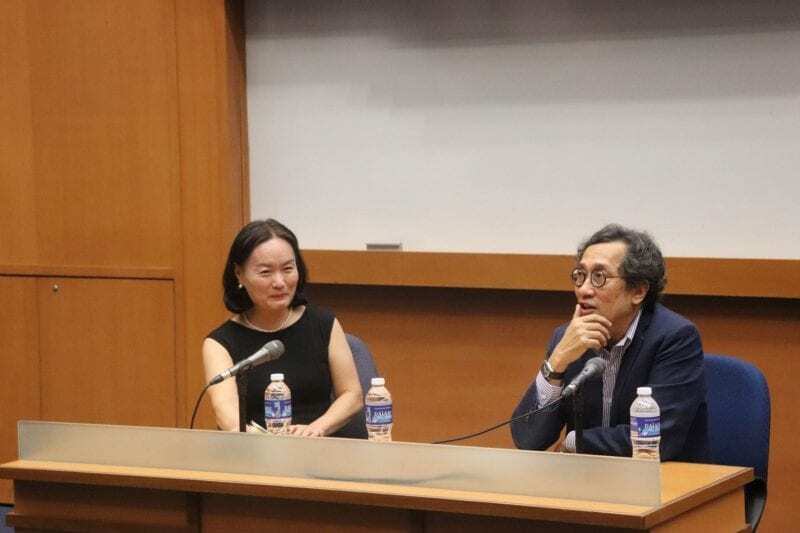 “The pragmatic realism of our first-generation leaders recognises that even small countries are never without agency, and were willing to take risks when the interests at stake were important enough,” said Mr Kausikan, referring to instances such as Singapore’s rejection of Chinese demarches to support its position on the South China Sea disputes in ASEAN forums. 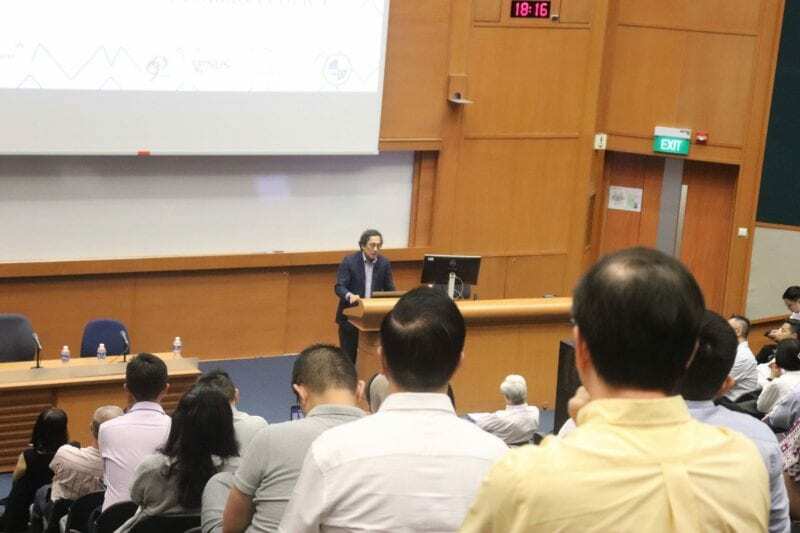 His warning was clear: if Singapore did not stand up for itself and exercise its agency as a sovereign state to defend core national interests, it would soon find that agency taken away from it. 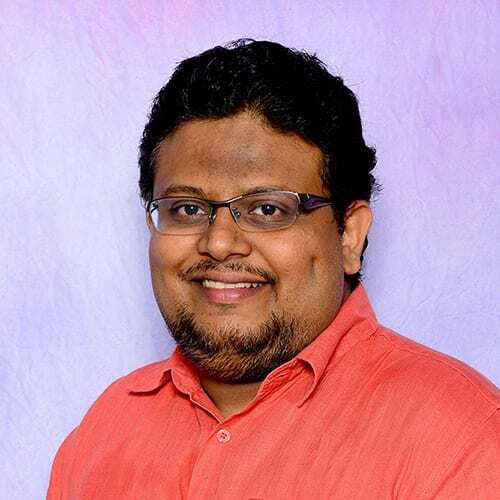 “Dealing with slices of problems rather than their broader implications, being narrowly transactional in relationships and blurring clarity by overly hedging assessments,” he cautioned. Mr Kausikan discussing future foreign policy considerations for Singapore. He was keen to emphasise that despite some similarities, Sino-American relations today are fundamentally different from those between the US and the Soviet Union during the Cold War. “The post-Cold War (world) is complex, not binary,” he stated. Following the dissolution of the Soviet Union in 1991, the Cold War-era of international political structure that had persisted for more than four decades abruptly came to an end. “Despite its many dangers, the Cold War international order was clear and simple; essentially binary in structure,” said Mr Kausikan. 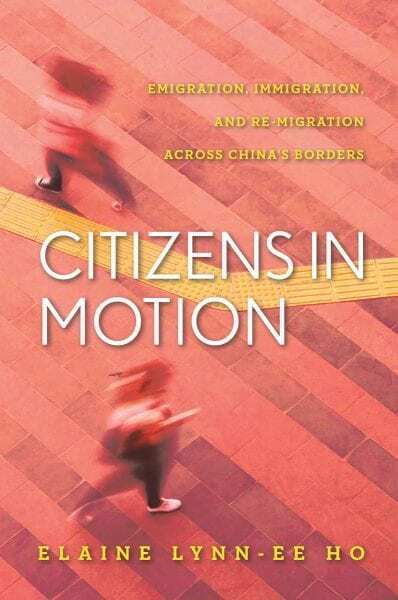 This is unlike China today, which is inseparably inter-connected with the American economy and that of the world. “Unlike the Soviet Union, China is an irreplaceable node in the global economy, as vital as the American economy,” he stated. “US-China relations are simultaneously inter-dependent in a way that is historically unique between major powers, and simultaneously infused with a deep strategic distrust.” Yet despite this distrust, Kausikan was adamant that Sino-American rivalry was not a zero-sum game as some claim. “China’s rise is not necessarily America’s decline, except in relative terms,” he said, dismissing it as another relic of an outdated Cold War-era mentality. Bilahari Kausikan discussing US-Sino relations. Mr Kausikan also noted that despite their vast differences, “both Obama and Trump are iterations of the post-Cold War metamorphosis of American values.” Both have attempted to spread the burden of leadership, particularly defence costs, onto America’s allies; Obama merely did so in a more tactful manner than his successor. This new hostile American stance to both China and globalisation will have serious implications for China, particularly for its ambitious Belt and Road Initiative. “China was the main beneficiary of the American-led post-Cold War globalisation. China may well be the main loser if that order should further fray because the US now embraces a narrower concept of leadership,” Mr Kausikan noted. Nevertheless, Mr Kausikan emphasised that despite the rancour of the trade war, the central theme of US-China bilateral ties was that of engagement and communication. “War is highly improbable, nuclear deterrence impels caution, engagement will not cease and the US and China will still cooperate when their interests coincide,” he stated. Given how closely the two countries are tied to each other and the rest of the world economically, a continued policy of engagement would bode well for all sides. 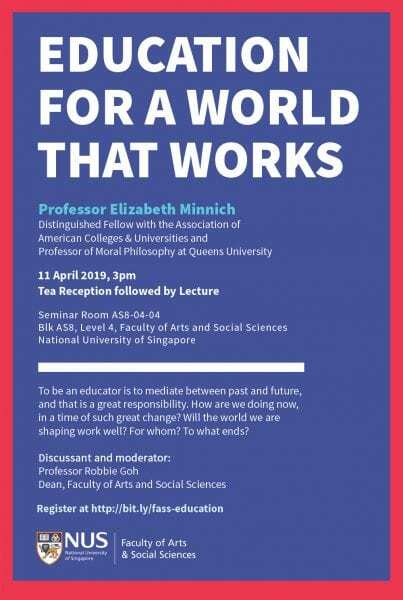 You are cordially invited to a FASS lecture “Education for a World that Works” by Professor Elizabeth Minnich. Professor Elizabeth Minnich is a Distinguished Fellow with the Association of American Colleges & Universities and Professor of Moral Philosophy at Queens University. Previously, she served as Dean and Core Professor at the Graduate School of the Union Institute and University. Her special appointments have included Visiting Scholar, Scholars & Seminars Program at The Getty Research Institute for the History of Art & The Humanities; the Hartley Burr Alexander Chair in Public Philosophy at Scripps College; the Daniel Evans Chair at Evergreen State College; the Whichard Visiting Distinguished Professorship of Humanities and Women’s Studies at East Carolina University; Visiting Distinguished Professor at the University of Hartford; the Carol Zicklin Visiting Scholar in Interdisciplinary Studies at Brooklyn College. Earlier in her career, she was Associate Dean of Faculty at Barnard College/Columbia University after teaching and serving in various administrative positions at Sarah Lawrence and Hollins Colleges. 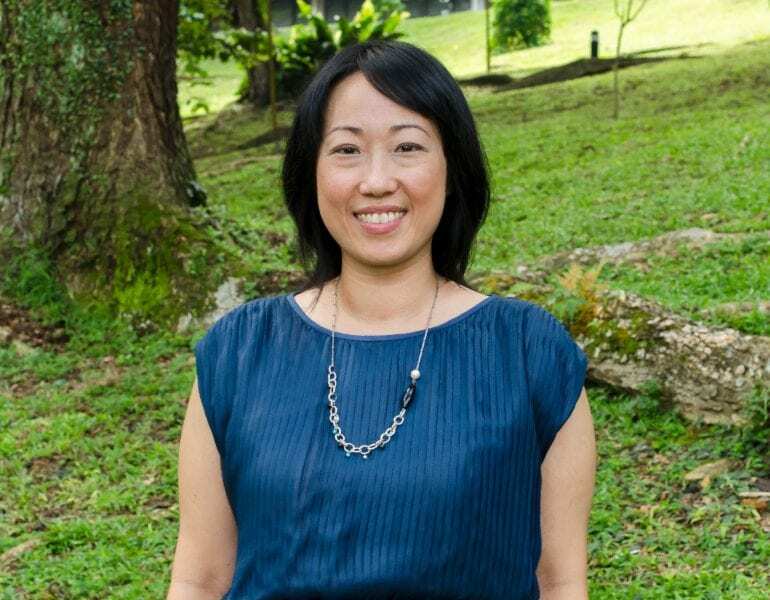 The lecture will be moderated by Professor Robbie Goh, Dean Faculty of Arts and Social Sciences. For catering purposes, kindly register via http://bit.ly/fass-education by 5 April 2019 (Friday). 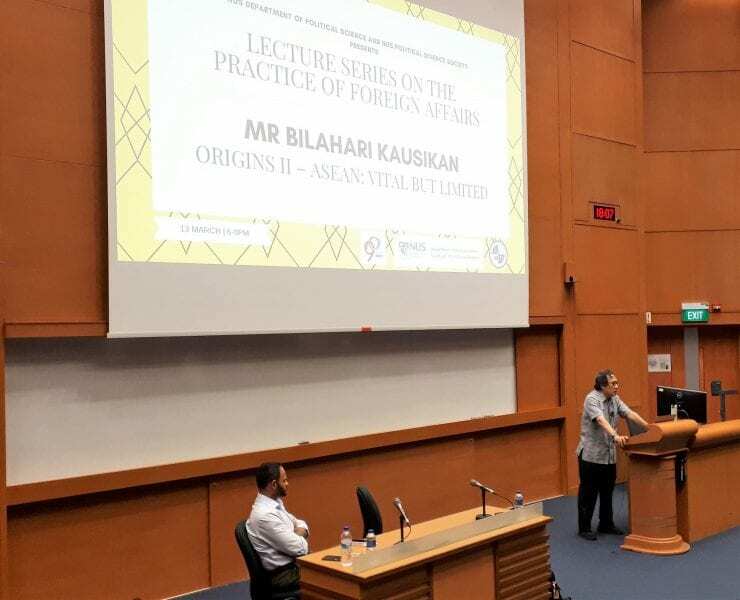 Bilahari Kausikan (Arts & Social Sciences ’76) discussed the Association of South-East Asian Nations’ (ASEAN) historical and current role at his third instalment of the Practice of Foreign Policy Lecture Series at NUS on 13 March 2019. ASEAN, according to Kausikan, was very much a product of the Cold War. Although the Bangkok Declaration, ASEAN’s founding document, emphasised economic cooperation, “for ASEAN’s first quarter-century, almost nothing was done to advance economic cooperation.” ASEAN’s true purpose at the time was to function as a bulwark against growing communist influence in the region, particularly after Vietnam invaded Cambodia in 1978 with Soviet Union’s support. 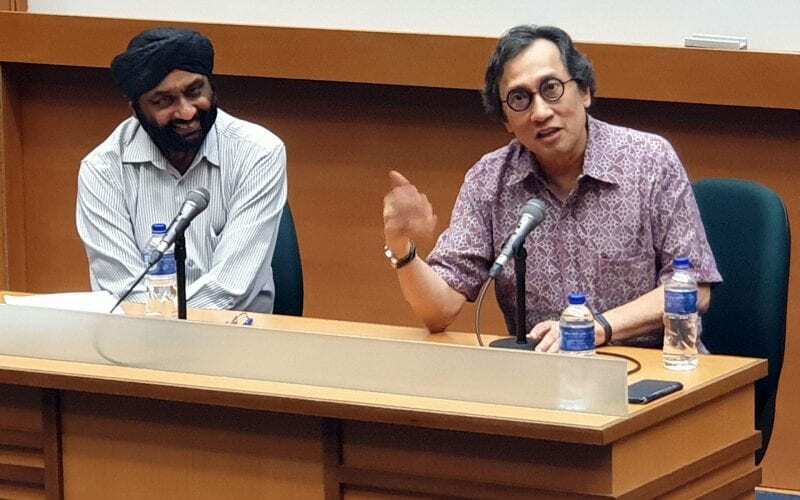 Bilahari Kausikan (right) responding to questions with Asst Prof Deepak Nair (left) from the Department of Political Science. Bilahari Kausikan sharing his insights on ASEAN with the audience. With the end of the Cold War following the collapse of the Soviet Union in 1991, ASEAN found itself in need of a new purpose. What was ASEAN to do now that communism was no longer a threat? Much of this was due to ASEAN’s “most fundamental consideration”, which is “to preserve the organisation, even if it means inaction or consensus only of form.” This meant that unless all member states agreed, ASEAN would choose the safe option and take no action. In a region with such vast differences in government styles and culture coupled with wildly diverging national interests, achieving unanimous consensus can be complicated and difficult even in the best of times. With four ASEAN member states currently locked in territorial disputes with China in the South China Sea, questions from the audience naturally gravitated the position ASEAN ought to take. When asked, Kausikan dismissed the idea of ASEAN playing a larger role in collectively engaging China on territorial disputes. “We (ASEAN) discuss the South China Sea collectively with China, but we can only do that on issues that are actually secondary or tangential to the core issue, which are the competing claims,” he stated. “Territorial disputes can by definition only be settled by the parties to the dispute,” which are primarily bilateral. The best thing ASEAN can do now regarding the South China Sea according to him, is to “make our red lines clear to both sides” and once again play a limited, but vital role in keeping the peace in the region. 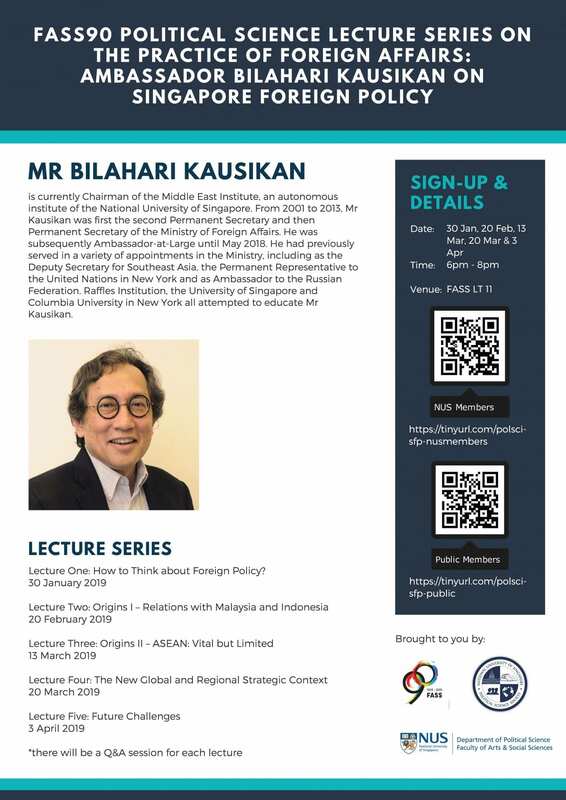 The third instalment in the series, Bilahari Kausikan addressing a full house on ASEAN. We are pleased to report that filmmaker Yeo Siew Hua, an alumnus from the Department of Philosophy, has won the Golden Leopard for his film A Land Imagined at the 71st Locarno International Film Festival back in August 2018. The film follows a lonely construction worker from China who goes missing in Singapore after forming a virtual friendship with a mysterious online gamer and a police investigator who uncovers much more than he bargained for in order to find him. A Land Imagined is released in Singapore theatres from 21 February 2019. In conjunction with FASS’ 90th anniversary, the Department of Political Science is organising a public lecture series on the Practice of Foreign Affairs. 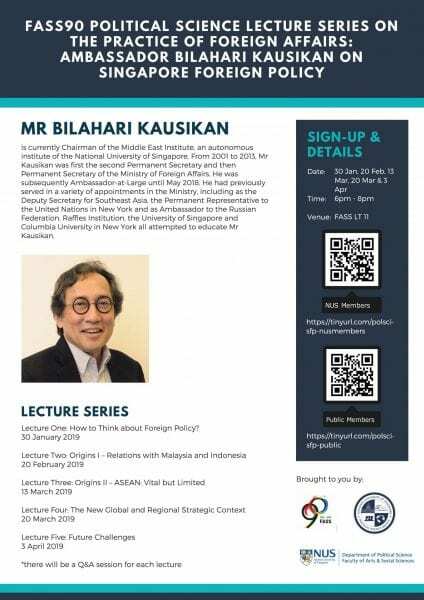 The guest lecturer is former Ambassador and currently Chairman of the Middle East Institute, Mr Bilahari Kausikan. Lecture One: How to Think about Foreign Policy? The first lecture situates the fundamental role of national interests in foreign policy. Why are Singapore’s national interests not better and more widely understood? The talk examines some common errors in thinking about foreign policy, as well as the creation and maintenance of relevance for a small city-state, and why small countries should not behave like small countries. 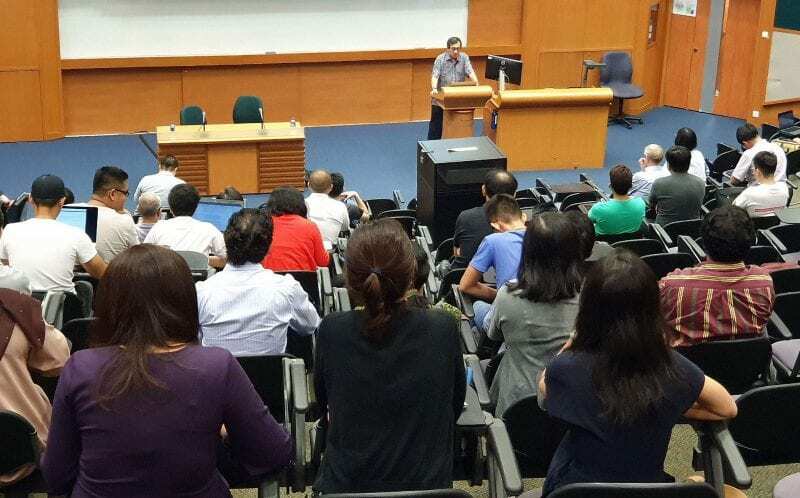 The second lecture conveys the inevitable complexity of relations with Singapore’s neighbours. 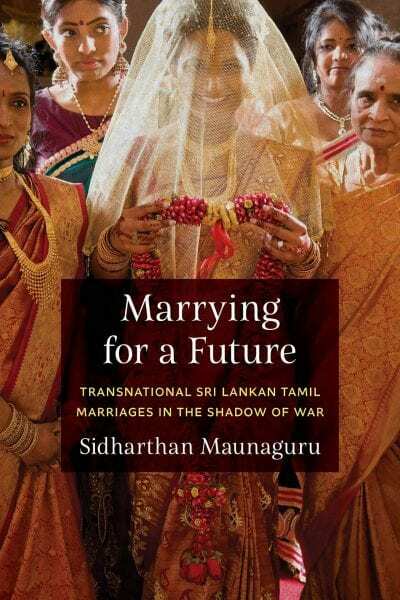 It provides an overview of the systemic origins of bilateral tensions with our neighbours, focusing on the uses and abuses of history, and the roles of ‘baggage’ and personality. 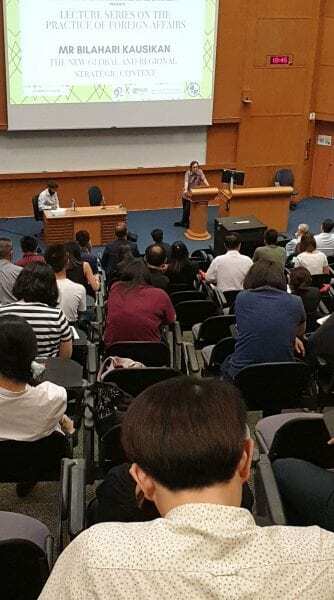 The talk ends with thoughts on how Singapore could manage complexity and cope with competing nationalisms with our neighbours. The third lecture discusses the origins of regionalism in Southeast Asia. It explains the necessity but also the limits of ASEAN. The talk will suggest that ‘it is pointless to criticise a cow for being an imperfect horse’. The fourth lecture looks at the key factors driving change in the global and regional order. Issues to be explored include: the nature of US-China relations, coping with competing influences, the roles of Japan, India, Australia, Russia and the EU. The talk also offers thoughts as to why the future of East Asia will be multi-polar. The final lecture in the series examines the interaction of foreign policy and domestic politics. It offers thoughts on how to manage uncertainty and emerging systemic vulnerabilities in Singapore. Click here to see the other Albie award winners.